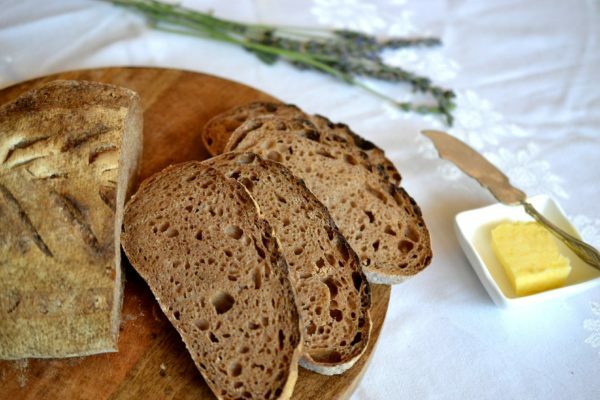 Sourdough bread step by step… and the benefits of fermented foods. Can you say (or even think) the word “sourdough” without your mouth watering? There’s something about that chewy, tangy flavor that is uniquely crave-worthy. And here’s something else to know about sourdough – it has some surprising health benefits as well. We learned all of this and more at the recent Fermentation Festival at 123 Farm at Highland Springs Ranch in Cherry Valley, California. Why fermented foods? This whole category of foods – which includes kimchi, pickled vegetables, sauerkraut, and even beer – contains beneficial bacteria that can boost your gut health, can be easier to digest, and can help your body better absorb nutrients. 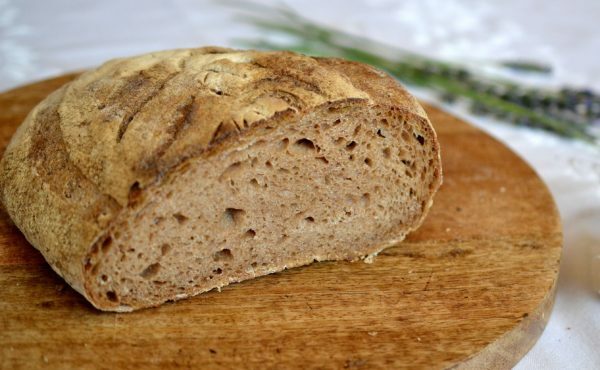 Sourdough bread, the oldest and most original form of leavened bread, also fits into that category of fermented foods. 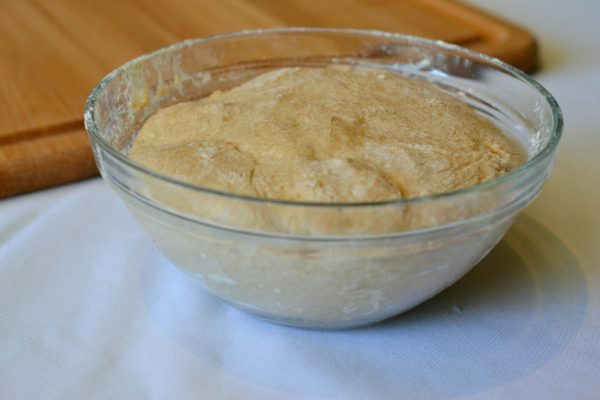 The basic idea is that “wild yeast” and lactic acid bacteria work together to ferment the dough and cause it to rise. 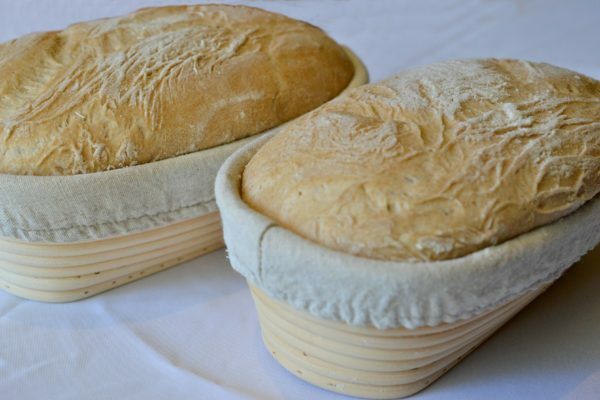 The fermenting process gives sourdough bread benefits over yeast-based bread – it contains higher levels of folates and antioxidants, and it contains compounds that help your body to absorb the bread’s nutrients more easily. (The sourdough starter has probiotics, but once the bread is baked it no longer contains those live active cultures.) It also contains acetic acid, which inhibits the growth of mold, and eliminates the need for preservatives. Interestingly, sourdough bread may also be easier to digest for some people with gluten sensitivities. The fermentation process breaks down the gluten into amino acids, making it lower in gluten levels than yeast-based bread. Making sourdough bread is a time-consuming process, which is why when the invention of packaged yeast came along, people started making breads with yeast, thereby cutting down the time it takes to make a loaf of bread from 8 to 10 hours down to about 2 hours. 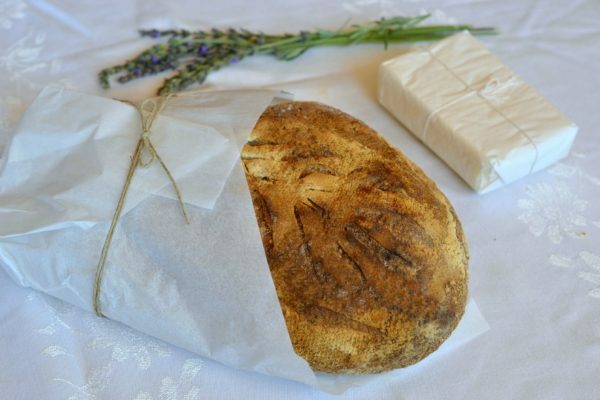 But in many food circles, especially the “slow food” movement, sourdough bread is seeing a recent resurgence as more cooks are willing to dedicate the time to making a more nutritious, durable, and digestible bread. Lange added that there’s even a strain of bacteria named for San Francisco, lactobacillus sanfranciscensis, which some people ascribe to the unique taste of sourdough made in the San Francisco area. While it seems like making your own starter would be a no-brainer, some experts recommend against it because it can be tricky to get it just right. If you don’t have a friend who’s able to pass along a starter to you, there are plenty of places where you can order a sourdough starter online (and you can even specify which geographic area you want it from, such as San Francisco). 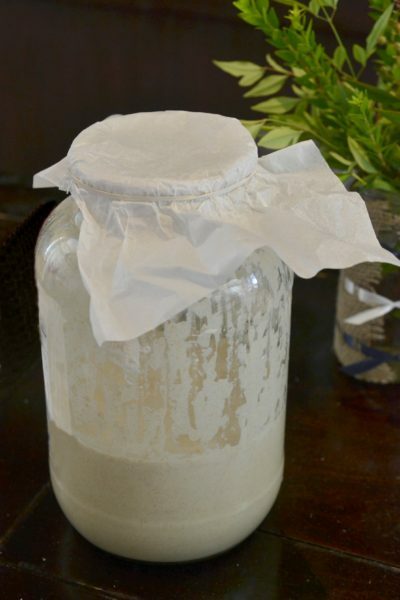 Feeding: This involves adding flour and water to your sourdough starter to keep it active and healthy. If you keep it at room temperature, you should do it once per day. If you keep it in the fridge, you can do it once per week. Autolyzing: This is where you combine the flour and water and allow them to rest before adding salt, leavening, or other ingredients. This allows for the hydration of the flour that brakes down the starch that will feed the bacteria in the sourdough starter. Mixing: This is where you add the starter to the flour and water mixture and turn it into dough. Lange recommends a ratio of 2 parts starter to 2 parts water and 4 to 5 parts flour. Folding/Turning and Kneading: This is where you take the dough and lift it up and fold it in half, several times over, to stretch out all four corners of the dough. 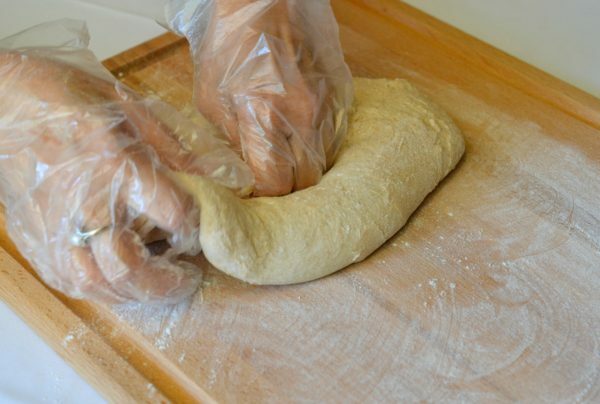 Note – We used plastic gloves in our workshop because there were several people working on each loaf of bread, so you don’t have to do this, but… it did make it easier to keep the moist dough from sticking to our hands. Bench Rest: This is the rest period you give the dough each time after you fold it and turn it, allowing the gluten to relax before its final shaping. Many sourdough experts recommend at least two rounds of folding and resting. Proofing and Scoring: This is the final rise of the bread before it heads into the oven. Often bread is proofed in proofing pans that are lined with a linen towel and flour, giving the bread its “bread shape” before it is baked. Many bakers score the bread with a knife to reduce air pockets and to give the bread a place to “break” as it expands. Proofing the bread before baking. Baking: The final step. Many sourdough experts recommend baking the bread in a Dutch oven to preserve moisture and create a crisp outer crust. You should bake it at 425 degrees for about 40 minutes. And in fact, Lange says that once the bread has come out of the oven, it’s not quite done. It needs an hour or two to “settle.” That is, if you can wait long enough to eat the hot, fresh bread out of the oven. The perfect amount of bubbles in a loaf of sourdough bread. If you’re new to sourdough bread, give yourself at least a couple of rounds to get it exactly to your preference. And once you get it there, you’re set for life. Side note: We’re serving cultured butter, another fermented food, with the bread. Cultured butter is pretty easy to make, and we like this cultured butter tutorial (don’t be scared off by the number of steps!) that breaks it all down step by step. The end result is a creamy, tangy butter that elevates the taste of just about anything you put it on, including (and especially) your homemade sourdough bread. Do you make your own sourdough bread? Let us know (and share your tips and tricks)! 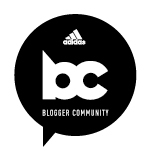 Blogger disclosure: I attended the Fermentation Festival at my own expense. All opinions expressed are my own. I did not receive compensation for this post. 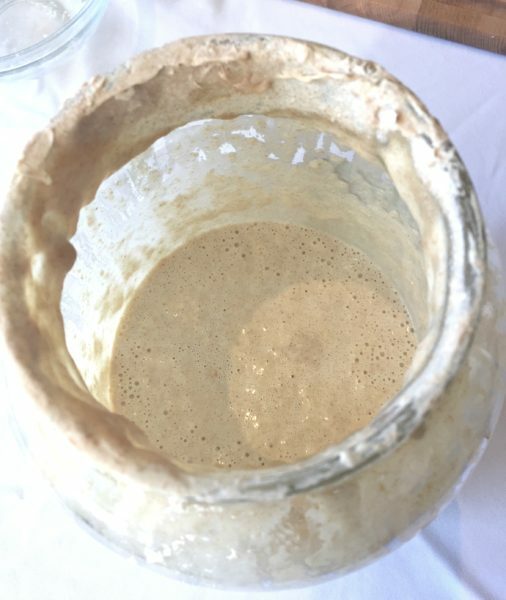 I JUST got my first sourdough starter and have been feeding it regularly. I cannot wait to make some delicious bread! Great! Would love to hear how it turns out! Thanks for stopping by! This is so great! I’ve been wanting to make my own sourdough for ages now and haven’t really had the courage to do so. Your post has given me that! I’ll report back with how it goes! Thanks for sharing! Glad to hear it! Thanks so much for stopping by, Billy!